The creepy doll from horror franchise Child's Play is set to star in his very own gory videogame. Videogame industry critics will soon have an actual virtual murder simulator to blame for the corruption of today's youth. TikGames has announced that it's translating horror movie franchise Child's Play into a videogame series called Chucky where players take on the role of the murderous doll. The Child's Play movies follow a serial killer that magically transports his dying soul into a kid's doll named Chucky. Chucky tortures, murders, and terrorizes innocent victims as he tries to transfer his soul back into a human being. The TikGames press release reveals that players will not be trying to stop Chucky, but playing as Chucky himself as they move through various environments killing people. 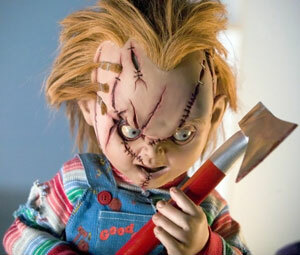 Chucky will use stealth-based skills to take people out with what TikGames calls a "multitude of distinctive methods." Players will have their choice as to how many people are left breathing, though something tells me in most cases it won't be very many. TikGames co-founder Alex Tikhman calls Chucky a "highly-entertaining, interactive, and downright gory experience." There isn't a whole lot of information on the upcoming game just yet, but I'm getting the picture of a game that could be something like the next Manhunt, as remaining faithful to the franchise would require quite the brutal game. I personally wouldn't have the stomach to play as Chucky as he stabs, chops, and saws his way through innocent people, but I'm sure there's an audience for a title like this amongst horror fans. Chucky hasn't been announced for any specific platforms at this time.